We get a lot of questions on US vehicle registration data and the vehicle registration database, like “how many cars are in the U.S.?” so here are some important things you need to know about buying and using automotive registration data. What is car parc? What is the definition of vehicle parc? You may see a reference to “US parc” or “US fleet” when referring to vehicles in operation (VIO). They’re all the same thing. “Parc” is a European term for all registered vehicles within a defined geographic region, originating from the French phrase “parc de véhicules” meaning the collective number of vehicles or a vehicle collection. Definition of car parc: all vehicles in operation (VIO). Where does vehicles in operation data come from? The original sources for all vehicle registration data we use for analysis are state Departments of Motor Vehicles (DMVs), the OEMs (Ford, FCA US LLC, General Motors, Toyota, etc.) and the OEM captive finance companies (an example is Ford Motor Credit Company, LLC, commonly just called “Ford Credit”). Note that registration data is not the same as our mailing lists, which do not come from DMVs. Each states’ DMV reports data on new vehicle registrations (sales) at the end of each month. This data then goes through an extensive process to get cleaned up and summarized. It is available about six weeks after the close of a month, usually around the 15th of the month. So, for example, March registration data would be available by mid-May. This vehicle data does not include personal information or VIN numbers due to privacy restrictions and agreements. 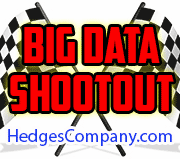 This data only covers make, model, model year and related information and is not tied to individuals. For data that does include information such as name, address, or other consumer data, we have mailing lists available and as a general rule our mailing lists cover 67% of all registered vehicles, or about 165 million vehicles and their owners. The vehicle registration data described here covers 99.9% of all registered vehicles, or about 261.8 million vehicles in 2016. The vehicle registration database goes through an extensive validation and clean up process which is why it takes six weeks before it is ready. The basic process is shown at left. 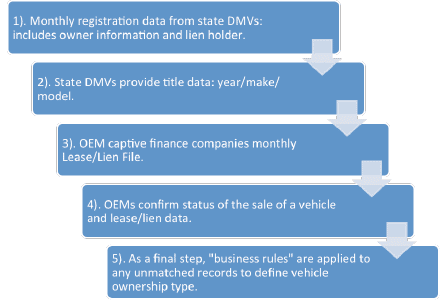 First, state DMVs provide monthly registration data including owner information and the lien holder. This data also gets revised and updated continuously so previous months are also updated. The state DMVs also have title data such as year, make and model. Next, the captive finance companies generate their monthly lease/lien file which is used for validation. Then the OEMs (original equipment manufacturers) such as GM, Ford or Toyota, confirm the sale of the vehicle and the lease/lien data. Finally, a set of business rules is applied to fill in the blanks. For example, if a vehicle registrant is a business and the vehicle is not leased, is the vehicle ownership classified yet? If not, in this case it would be classified as non-fleet commercial; registered to a business by an individual, more than likely a business owner’s personal car registered to and paid for by the business. We’re often asked how the data is different from what the government publishes; after all, why not just download it for free from a government website? This is a common question because you would assume the US government would be a great source for all vehicle data. The government can be a good source for general statistics and we’ll even give you links to some government sources below, but there are important differences. For one thing, states are required to report total registrations to the government using form FHWA-561 once per calendar year or fiscal year. The fiscal year for 46 states ends June 30 but four states end in March, August or September. 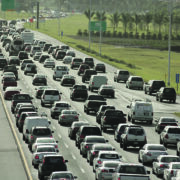 The data is then due to the Federal Highway Administration (FHWA) by January 1 of the following year, as much as six months later. A lot of data changes each month, let alone over six months! The data our clients rely on has major updates 12 times per year with continuous updates and maintenance. For another important difference, states only report the number of total vehicles to the government, not detail on year, make or model. There is also a lag time in when data is reported. The most recent data available from the Bureau of Transportation Statistics are for the 2016 calendar year (not to be confused with vehicle model year). In other words the government is telling you up front you can’t compare 2007-2016 numbers to earlier years. This is important to know. In other words, government vehicle registration data includes vehicles no longer in use, and it double counts vehicles within the same state and across multiple states! In one of the most glaring examples of government data changing, in 2010 the government reported 2,235,826 trucks in the state of New York. 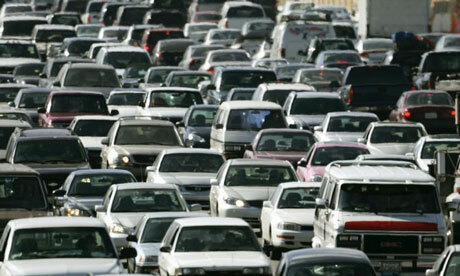 The government’s 2011 data increased that number to 4,169,695, an unexplained increase of 1,933,869 trucks! For all the reasons mentioned above, over the past 10 years, the data we use differed from US government data by an average of 3.5 million vehicles per year. 4). The government isn’t a source for detailed vehicle information. U.S. Government registration data doesn’t include detailed information such as vehicle type, ownership type, engine displacement, MSRP and other details. Government data also doesn’t give an accurate breakdown by state, and does not distinguish between vehicles owned by consumers, businesses, or government agencies. Examples of this detail not available from the U.S. government is shown below. Our analysis is derived from vehicle make, model, year, fuel type (flex fuel, convertible, compressed natural gas, LP/propane, hybrid, electric, gas, or methanol), engine displacement, truck GVW class (weight), MSRP, body style and vehicle segment. This lets us create an analysis to give you a complete understanding of the market. Vehicle types include convertible, 2 door coupe, CUV, 2-door, 3-door and 4-door hatchback, 2-door and 4-door hardtop sedan, 2-door, 3-door and 4-door liftback, sport, van and wagon. Please note: We don’t sell registration data outright, we only provide analysis and reporting. When did VIN codes become standardized? As a general rule, data for model years prior to 1981 is less accurate because Vehicle Identification Numbers (VINs) were not standardized. In 1981 the National Highway Traffic Safety Administration (NHTSA) required all OEMs to use a standarized 17-character VIN code which is now in use worldwide. Before 1981 vehicle manufacturers used non-standard VIN codes that were as short as 11 characters or as long as 17 characters, and it was impossible to track all of these vehicles consistently in one central database. Standardized VIN codes also helped NHTSA issue and monitor vehicle recalls for safety problems. All major makes are included in the vehicle registration database, including discontinued makes such as Pontiac or Oldsmobile. The data includes Acura, Audi, Bentley, BMW, Bugatti, Buick, Cadillac, Chevrolet, Chrysler, Daewoo, Dodge, Fiat, Ford, Geo, GM, GMC, Honda, Hummer, Hyundai, Infiniti, Isuzu, Jaguar, Jeep, Kia, Lancia, Land Rover, Lexus, Lincoln, Mazda, Mercedes-Benz, Mercury, Mini, Mitsubishi, Nissan, Oldsmobile, Plymouth, Pontiac, Ram, Saab, Saturn, Scion, Smart, Subaru, Suzuki, Tesla, Toyota, Volkswagen and Volvo. We have summary-level information on vehicle registration statistics available here. We have been a source for vehicle data for various news outlets including NBC Nightly News with Brian Williams, Bloomberg Businessweek, the Wall Street Journal’s MarketWatch, the Denver Post, the Detroit News and the Seattle Times. I am a recently retired developer who is looking to create a mapping website showing information on hybrids and electric vehicles. I am interested in a dataset by zip code containing these vehicle registrations. Hi Tim, thanks for stopping by our blog. We rely on complete datasets on hybrids and EVs to produce our derived reporting. We’ll send you an email with information. I am interested in registration data for Jeep Wrangler JK by zipcode. Could you send me some information regarding the availability of this information? Hi Wyatt, thanks for your interest in our vehicle registration data. We sent you a follow up email. Please let us know if you have any additional questions. We have also just posted a new Frequently Asked Question page on vehicle registration data.